It’s time to build a scarecrow! Let’s have some fun!! The Ashland Area Chamber of Commerce presents the Annual Chamber Member “Scarecrow Contest” Be creative! We encourage you to build a Scarecrow and place it in front of your place of business. First place prize is $75 in Chamber Dollars. Second place prize $50 in Chamber Dollars. Third place prize $25 in Chamber Dollars. Completed scarecrows should be on display outside September 30 through Memorial Medical Center WhistleStop on October 13. To register your Scarecrow, call the Chamber to be eligible for the prizes! (715-682-2500) or email (ashchamb@centurytel.net). Judging will take place the week of WhistleStop. Don’t Miss Out!! 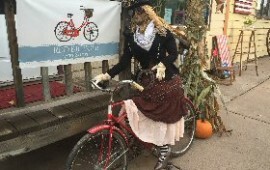 Showcase your business/store front with a great scarecrow and you could be the winner! Be sure to register your Scarecrow with the Chamber!